In the world of cooking, garlic is ubiquitous. This flavorful little bulb is used in cuisines throughout the world and has a history dating back thousands of years. Many praise the ingredient for its medicinal value. There's enough information out there to write a book on garlic, but we're not going to do that today. Instead, we'll share five handy tips you can use whenever you cook with this amazing ingredient. If you're reluctant to use garlic in your cooking because of its overpowering taste and smell, give these tips a try and garlic just might become your new BFF. Instead of mincing or crushing garlic, try slicing it. When you crush garlic, a molecule named alliin comes into contact with an enzyme known as alliinase. 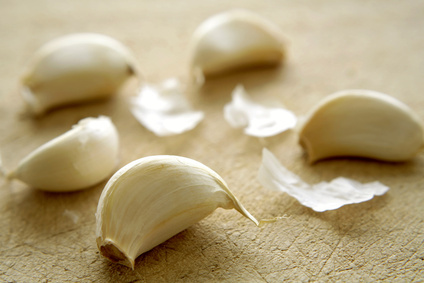 The strong odor associated with garlic is released when alliin and allinase come in contact with each other. If you slice garlic, you'll get the wonderful flavor without the bad breath. If you want to be a total gangster, you can whip out a razor blade and slice your garlic like in Goodfellas. Otherwise, a sharp knife or a truffle shaver will do just fine. If you need to crush garlic and don't have a press, place some cloves inside a resealable plastic bag and crush with the back of a knife. You'll keep your cutting board and your hands from smelling like garlic. Peeling cloves of garlic can be a complete pain. The next time you need to peel a bunch of garlic, microwave the unpeeled cloves for 15 seconds. The skin will then come off quite easily. If you want to shell out $7, OXO makes a silicon garlic peeler. It's absolutely amazing. To get the garlic smell out of your hands, rub them vigorously on some stainless steel for about 20-30 seconds. A metal spoon or the edge of your sink will do just fine. If you want to get fancy, you can even buy a metal "soap bar" made specifically for this purpose. This also works for onions too. Always use fresh garlic. If your garlic cloves have been sitting around for a while or have green shoots growing in the center, toss them. Fresh garlic has a "sweet" flavor to it. Old garlic is bitter. Also, you should *never* buy the bottled garlic available at supermarkets. It might save you a few minutes in the kitchen, but it's overpriced and tastes awful. This stuff is nothing like fresh garlic. The next time you're cooking with garlic, be sure to try these 5 tips and you'll make the most of this mighty little vegetable. Making perfect hard boiled eggs is trickier than you might think. While undercooking typically isn't an issue, overcooking is much more common and leads to a dry, blue yolk and a tough, rubbery white. Yuck. Here's a simple foolproof method that will produce perfect hard boiled eggs everytime. This method can be used to make up to a dozen eggs. 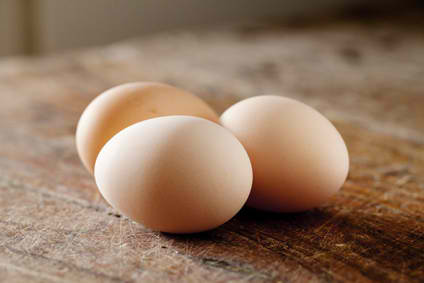 Place eggs in a large pot and cover with an inch of cold water. It's important that there's enough room for the eggs to be arranged in a single layer. On high heat, bring the water to a boil. Once the water reaches a boil, remove from heat, cover, and set aside for 10 minutes. While the eggs are resting, prepare an ice bath consisting of equal parts cold water and ice. Transfer the eggs to the ice bath and let sit for five minutes. Peel eggs and use. Or, store for up to 5 days. We love using this method because it's almost impossible to overcook the eggs. Try it and you'll see! Yesterday, New York Times food writer Mark Bittman published a compelling commentary titled "Which Diet Works?". In it, the notion that all calories are created equal is challenged. "Big food" would have you believe that your body treats 100 calories of Cheetohs is the same as 100 calories of spinach. When consumed, highly processed carbohydrates cause dramatic spikes in blood sugar and insulin levels. A recent study from JAMA, the Journal of the American Medical Association compared the results of three diets. The first was a standard low-fat diet. The second, a low-carb diet similar to the Atkins diet. And the third, a low-glycemic index diet consisting of mostly unprocessed foods. And the results? The 12 week study showed that the low-glycemic index diet stood the highest chance of improving health in the long run. Mr. Bittman's article and the JAMA study had a simple takeaway: compared to other diets, a low-glycemic index diet consisting mainly of unprocessed foods has numerous health benefits because of the nature of the calories being consumed. In other words: all calories are not created equal. We're adding new recipes and features to FoodPair everyday. It's our mission to make it very easy for everyone to find recipes. Many people have dietary restrictions or preferences, and sometimes this can make it a pain to find recipes. We recently added five new dietary filters that we're really excited about. FoodPair users now have the option to limit search results to show dairy-free, gluten-free, pescatarian, red meat-free, and shellfish-free options. In addition to our new filters, users can still filter by vegetarian, vegan, low-carb and, low-fat diets. You can also combine filters to get even more specific results. For example, clicking both "gluten-free" and "shellfish-free" will show you over 100,000 recipes that meet both requirements. Since dietary restrictions typically don't change from search to search, we also make it easy to save these preferences. When you set the diet filter, you'll see a padlock appear at the bottom of the menu. Click the icon and you'll lock this filter until the next time you change it. Over the last several years, olive oil has found its way into the mainstream. Once an ingredient mostly associated with Mediterranean cooking, this healthy and tasty ingredient is now a staple in many kitchens. Most store bought olive oil is overpriced for the quality you're getting. It's not uncommon to pay $10 for a 375ml bottle of mediocre olive oil. More on this below. Selling olive oil that has blended or adulterated is an underhanded trick pulled by some bottlers. 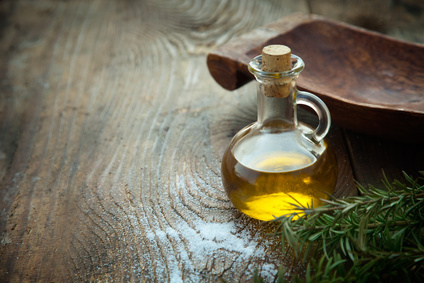 While a bottle may be labeled as "Olive Oil" or "Extra Virgin Olive Oil", you might find in small print that what you are buying is a mix of oils including olive oil. Price is usually the biggest giveaway here. If you find a bottle of olive oil that is priced exceptionally low, it's probably too good to be true. Olive oil has a shelf life of about a year under ideal conditions. Most olive oils found in supermarkets are sold in clear glass or plastic bottles and are being bombarded by fluorescent lighting 24/7. It's a bad combination that leads to a shorter shelf life. We're big proponents of buying olive oil in bulk. The benefits are many. Stores like Whole Foods are starting to offer a variety of high-quality olive oils sold in bulk at very reasonable prices. At $5-7/lb, you're getting a superior product at a much better price. Most bulk oils are stored in metal canisters, preventing exposure to light and extending the oil's shelf life. Bulk oils are also being restocked on a regular basis, so what you're buying is most likely a lot fresher than bottles sitting on a shelf. An added benefit of buying bulk is that you get to try before you buy in many cases. If freshness or quantity is a concern, going bulk means you can buy in smaller quantities, more frequently. At stores like Whole Foods, you can even bring in your own containers. Give it a try and let us know what you think! 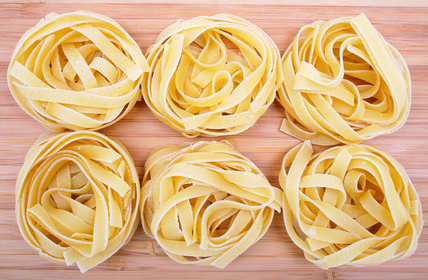 The folks at CHOW recently teamed up with food writer and kitchen scientist Harold McGee to show us a clever way to prepare pasta in less time. The traditional way of cooking pasta (spaghetti in this case) goes something like this: Bring a large pot of water to a boil, add salt, add pasta, and then cook for 9 minutes. Pretty standard stuff. But, according to Mr. McGee, there's a better way. By using a frying pan instead of a pot, and by placing the pasta in the water from the beginning, you're able to save time, energy, water, and a little bit of salt while getting the same results. We placed 4 quarts of cold tap water into a 6 quart stock pot and brought it to a boil. On high heat, it took 22 minutes. Then we added 2 tablespoons of sea salt and a standard two ounce portion of spaghetti and cooked for 9 minutes. From start to finish, it took 29 minutes. For the frying pan method, we placed 1 quart of cold tap water, a standard two ounce portion of spaghetti, and 1.5 teaspoons of sea salt into a 10-inch frying pan and cooked on high heat for exactly 15 minutes. Both methods produced perfectly cooked pasta. Given the identical results, it's a no-brainer: the frying pan method is the way to go. You end up using 75% less water and salt, and get the job done in half the time. A few notes: We only used single portions of spaghetti in our trials, but there was plenty of room for additional pasta. Also worth mentioning is that you can use other types of pasta. Cooking times vary by shape, so be sure to adjust accordingly. One of my favorite cookbooks is Thomas Keller's Ad Hoc Cookbook. In case you're not familiar with the name, Thomas Keller is the proprietor of The French Laundry, which is consistently rated as one of the top restaurants in the world. He's also the chef/owner of Per Se, Bouchon, and Ad Hoc. Rinse your greens then spin - When cleaning your greens, place them in a bowl of cold water, but do not drain into a colander. This reintroduces the dirt you just washed off. Instead, place the leaves in a salad a spinner to properly remove excess moisture. Season each ingredient - Apply salt and other seasonings to the ingredients separately before combining. Each ingredient is unique and requires a different amount of seasoning. Dress your salad evenly - When dressing your salad, apply the dressing to the sides of the mixing bowl instead of pouring it on top of your ingredients. Then, toss the greens lightly. Doing so ensures your salad is evenly coated with dressing. Pay attention to weight - If your salad contains many components, consider using a shallow serving dish and placing the lighter ingredients on top. This makes it easier to try all the ingredients in the salad. Be sure to try these tips out the next time you make a salad and you'll notice a huge difference. Orange you glad you saw this? The New York Soda Ban: Fair or Foul? On Fridays: It's Go Big or Go Home! It's Chocolate Ice Cream Day! Sweet Treats for National Candy Month!